NOTE: I have updated this essay to include a response from Nancy MacLean and my response to her response. 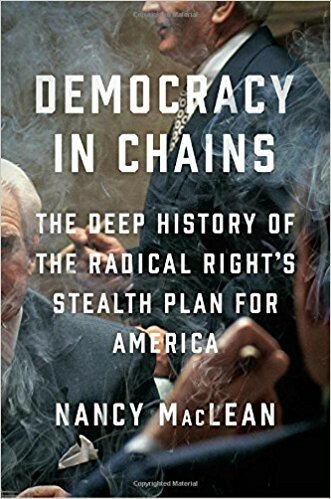 Nancy Maclean’s book, Democracy in Chains, describes Nobel laureate James Buchanan as a shill for the Koch Brothers who worked to advance a far-right agenda that threatens democracy to this day. I hope others who know Buchanan’s work better than I do will assess the accuracy of MacLean’s portrait of Buchanan. The weakening of checks and balances would increase the chance of a very good outcome. MacLean left out the word “While” that begins Cowen’s sentence. Then she left off the key qualifier that completes the sentence — the point that the downside risk of weakening checks and balances is substantial. There is nothing here suggesting Cowen is in favor of weakening democracy or the Constitution. By quoting only a piece of Cowen’s sentence, MacLean reverses his meaning. I can only hope that MacLean simply missed this paragraph. NOTE: After finishing this essay, I shared it with Nancy MacLean promising to post a response if she wanted to write one. Her response follows. I respond to her response as well. I can understand why as a friend and colleague you would want to defend the reputation of someone you admire and respect. And why, in that effort, you chose to play a snapshot “gotcha” game. But, alas, two can play that game. In your lead sentence alleging that my book “describes Nobel laureate James Buchanan as a shill for the Koch Brothers” you conveniently ignore that what I actually said was that he didn’t “start out as a shill for billionaires.” And you neglect to mention that I end the book with an account of how when Buchanan realized that in the eyes of Charles Koch — and Tyler Cowen, I might add — he had become a shill, he essentially walked away from the cause, even though he had just been named co-director with Charles Koch of the George Mason operation. But let’s get to the real point. As a historian I did not depict anyone in that cause other than as they presented themselves, through the totality of their words and actions, in the documentary record we have. 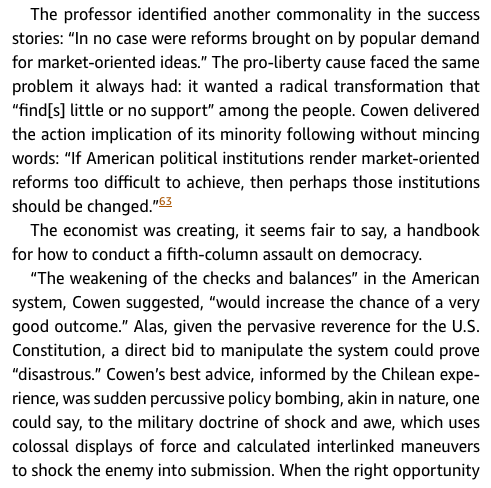 You may think that the material you cite definitely shows Cowen as not eager to pursue non-democratic alternatives. I read it differently and I stand by my interpretation. To say that nondemocratic forms of government can have unfavorable outcomes and that “I explicitly favor more democratic forms,” is not the same as saying that I support and would not be involved in any attempt to overturn the American democratic system of majority rule. 1. Is it true that Koch-subsidized libertarian scholars, including Buchanan and Cowen, have posed democracy as a problem for their arch version of capitalism? 2. Do you deny that the now hundreds of organizations funded by the Koch donor network are engaged in what Charles Koch himself, in a pivotal speech at your former institution, George Mason University, called “interrelated plays” designed to alter the very nature of our society and government? Now, lastly, a final question: did you actually read my book? Perhaps I misinterpreted your line that Buchanan didn't “start out as a shill for billionaires.” I took that to mean that he ended up as a shill though he didn’t start out that way. If you meant something else, I apologize. I have not read all of your book nor did I claim to. What I wrote about was the way you characterized Tyler Cowen’s writing in an essay you chose to spotlight. I think you mischaracterized his views in that essay and quoted him in ways that are misleading to your readers. The essence of a constitutional republic is to have a democracy, yes, but a democracy that is not subject to the potential tyranny of the majority. The Constitution and the complex system of checks and balances that make up the American system of governance are designed to limit the ability of a majority of the American people to decide how I speak, how I practice or choose not to practice a religion, how I behave in my bedroom, who I marry and so on. That’s not my reading of what James Buchanan or Milton Friedman or F. A. Hayek, the modern intellectual leaders of classical liberalism, the cause you are criticizing, wanted at all. They wanted power to be less concentrated so that no one’s hands are decisive in how we live our lives. They want more bottom-up and less top-down control. They want decisions made by the many and not by the few. I would add in passing that the weaknesses of stand-alone majority rule go back to Condorcet in the 18th century up through Kenneth Arrow in the 20th century. Neither, as far as I know, was funded by the Koch Brothers. Kenneth Arrow was not a fan of oligarchy. I can’t speak for Condorcet. The problems of majority rule are part of a more general challenge of collective choice. James Buchanan thought long and hard about these issues and for his work, received a Nobel prize. I recommend this conversation with your Duke colleague Michael Munger on these topics. You ask whether “Koch-subsidized libertarian scholars have posed democracy as a problem for their arch version of capitalism.” If by that you mean, do libertarian scholars dislike democracy, the answer is no. Do they recognize that the political process in America yields results they don’t like, the answer is, of course, yes. You ask whether the institutions funded by the Kochs are “designed to alter the very nature of our society and government.” Of course they are. They want to change the world and make it what they consider a better place. The same is true of institutions funded by interventionists. They disagree over what makes the world a better place. Those disagreements are part of democracy and the marketplace for ideas. You’re part of that marketplace and so am I. I assume that your vision of a good society, though different from mine, is well-intentioned. I ask for the same respect in return.